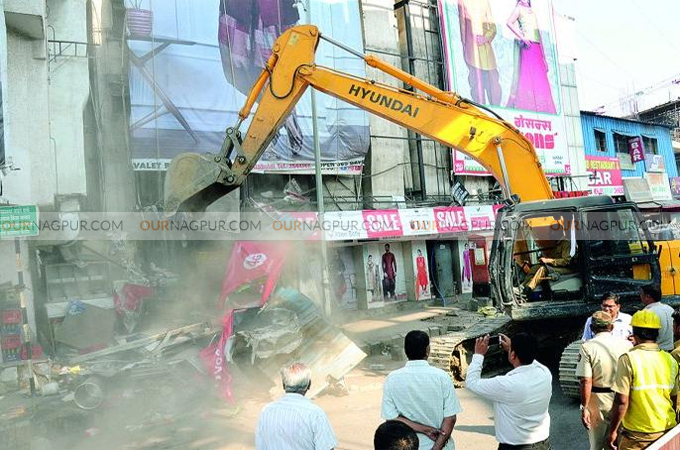 Nagpur : As per the directions of Supreme Court, Nagpur Improvement Trust (NIT) has started demolition of shops of Sitabuldi main road situated in the front margin of the Buty Mahal plot, to pave way for the long stalled construction of Glocal Mall. The demolition team of NIT under the guidance of Executive Engineer Pramod Dhankar began demolition drive at 11 am on Tuesday morning. Nagpur Police provided heavy police bandobast of 205 staff members to control any untoward incident. At the outset, the shopkeepers demanded to give them more time to vacate the shops. On their request, demolition team gave them time to remove their belongings. The demolition drive started from the back side of the shops. 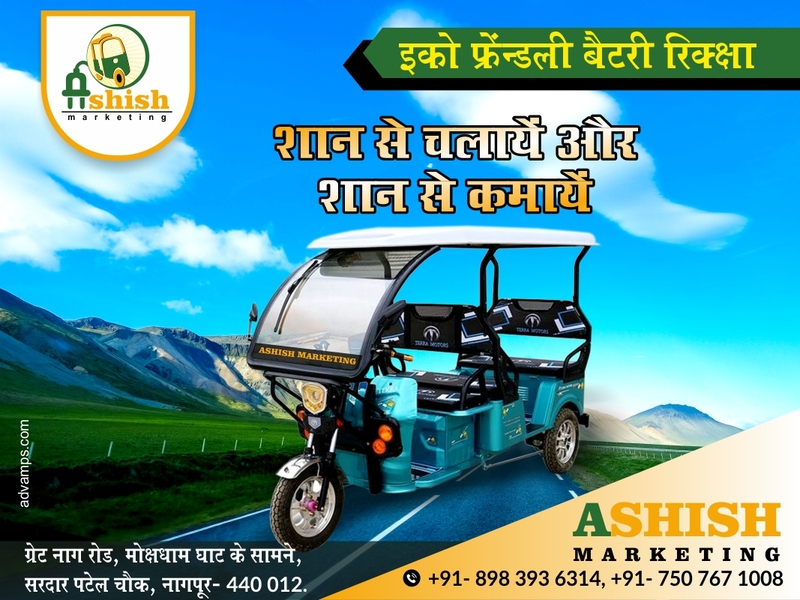 The team demolished back portion of Dream Shopee, Breakfast and Juice corner, Sadanand Juice, Bombaywala, Bata/ Buty House, Selection House, Quality Cloth, Rajkamal, Samrat, Fashion Bazar, Chafekar, Dube Sound, Kewal Men’s, Sona Sons, Vishranti Gruha and Gaysons. NIT has given three days time till February 8 to the shopkeepers to remove their materials. The drive will resume from February 9 to demolish all the shops. DCP Zone- 2 Chinmay Pandit also visited the spot. Officers Pankaj Ambhorkar, Manoj Itkelwar, Vivek Zade, Vivek Dafre and Enforcement Officer Manohar Patil were present during the drive. The team demolished the shops with the help of 4 JCBs and 2 poclains. The shopkeepers frantically tried to save their establishments and knocked the doors of NIT Chairperson Sheetal Ugale to stall the drive. After a meeting between shopkeepers, developer and NIT officials, it was decided to provide some more breathing space to these major establishments. After a bitter legal battle in various courts, Apex Court set aside Nagpur Bench of Bombay High Court’s order recently. The Apex Court while allowing the special leave petitions (SLPs) filed by landowners Buty family, Nagpur Improvement Trust (NIT), developer Goel Ganga, and Abhyankar Road shopkeepers, upheld their major argument that Buty Mahal Street Scheme had merged into subsequent Development Plan and hence NIT was right in approving the layout plan. Due to opposition of only 18 shopkeepers, the Glocal Mall project of Goel Ganga was delayed by several years. The Supreme Court had also noted anxiety of Abhyankar Road shopkeepers, who were in a lurch due to this legal battle, and totally disagreed with stance taken by the High Court virtually quashing the sanction to project. The High Court had held that 15 mtr internal criss-cross road connecting Abhyankar Road and Sitabuldi main road was ‘vital to decongest Sitabuldi’ and layout plan sanctioned by NIT and building permit were contrary to Buty Mahal Street Scheme. All the stakeholders had claimed that the scheme had merged into sanctioned Development Plan and it was wrong to accord primacy to the old scheme to make subsequent developments redundant. The mega commercial complex is spread over 8-acre land belonging to Buty family in the heart of Sitabuldi. The developer had promised to accommodate big retailers, existing shopkeepers and even hawkers along with earmarked parking for 1,500 cars, 1,800 two-wheelers, and 1,800 bicycles to revive the sagging fortunes of Sitabuldi market.